(CNN) - The Occupy Wall Street protesters are giving voice to the sentiments of families across the United States, senior Obama adviser David Plouffe said Tuesday. "The protests you're seeing are the same conversations people are having in living rooms and kitchens all across America," Plouffe said on ABC's "Good Morning America." "People are frustrated by an economy that does not reward hard work and responsibility, where Wall Street and Main Street don't seem to play by the same set of rules." 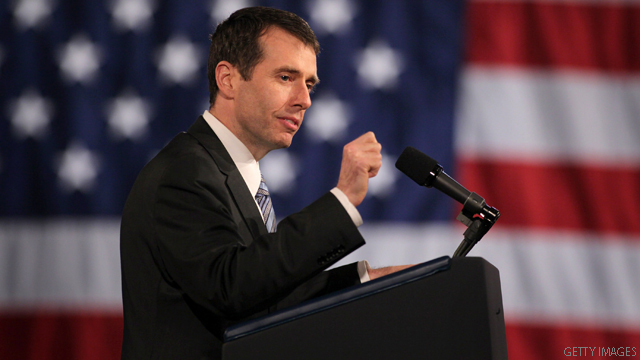 Plouffe, who served as Obama's campaign manager during the 2008 election, contrasted the president's Wall Street reform efforts with those of Republicans in Congress and the GOP presidential candidates as evidence he is chiefly concerned with the success of the middle class. "If you're concerned about Wall Street and our financial system, the president's standing on the side of consumers and the middle class and a lot of these Republicans are basically saying 'you know what, lets go back to the same policies that led to the great recession in the first place,'" Plouffe said. Nearly four weeks into the protests, the now national Occupy Wall Street movement has stirred public debate over the power of Wall Street and corporate greed. While Democrats have been largely sympathetic to the protesters' concerns, several Republicans and GOP presidential candidates have described the demonstrations as "class warfare." GOP hopeful Mitt Romney on Monday called the protests, where he said he sees Americans attacking Americans, "a mistake." "I think the idea of dividing our nation in a time of crisis is the wrong way to go," Romney said at a town hall meeting in Milford, New Hampshire. "All the streets are connected. Wall Street is connected to Main Street and so finding a scapegoat, finding someone to blame in my opinion isn't the right way to go." Following sympathetic words from President Obama and House Minority Leader Nancy Pelosi, the Democratic Congressional Campaign Committee asked supporters Monday to sign a petition in support of the movement. How true that statement is, and we can’t just blame Obama, you have to start after the 2006 election where the Democrats took over in Congress. It’s one failure after another. "Economic frustrations stirring Wall Street protests"
I wish the administration and media would cover these "protests" for what they truly are. I walked by the Occupy Boston demonstrations this weekend and realized all it was is a bunch of young adults who want a place to party and do drugs. Plain and simple. None of these kids have any idea why they are protesting. It looks and smells like a few concerts I attended back in the day. I'm sure these kids are making their parents proud! Just another example of the gimme generation at its best. This whole "movement" 'is a joke and it's too bad because the original premise was spot on. Politicians are in the pockets of big business. Big business is getting rich, politicians are getting rich and the middle class stay unemployed. These "protests" are doing a disservice to the original cause. The teleprompter president and the entire Democratic Party are in trouble with the voters, the Democrats put us in this mess and there will be no second chance for Democratic Party in Congress. If the Democratic Party continues to support Obama and not run another candidate; you will see the Democrats get massacred in the 2012 election. There won’t be enough Democrats left to call it a party. Eventually, it will sink into those who were elected to represent "the people"
Democrats need to take NOTICE and the Republicans better get off their high steeple! Bunch of crapola coming from the administration. This protest is manufactured by the Democrat Party. You have a bunch of 20 year olds deficating in the public streets crying "We need Socialism!! Give me mine!" Pathetic, I hope the NYCFD turns the hoses on these losers at least to clean up the filth they are leaving behind. Another luminous remark of the obvious. SpongeBob even with a pint or two in his belly could have made the same deduction. Stating the obvious reason for the protest for what reason? Do they think we are that stupid? It looks like class warfare because it is class warfare. The wealthy have been hammering the middle-class and the poor for over ten years and the Republican Party is the Department of Defense for the rich. These protests will grow and ultimately folks like the Koch brothers will take notice. It's time to level the playing field and require the rich to share some of the sacrifice of the recession they caused! Republicans are basically saying 'you know what, lets go back to the same policies that led to the great recession in the first place,'"
How can Congress just sit on their lazy butts, collecting a salary and benefits on our dime and not vote in the jobs bill? They obviously do not represent most people in America. Do they get the message that their rating is at an all time low? Vote them out!! Plouffe is confussed. Capitalism does reward hard work and responsibility. Governemnt rewards those who do not want to work and are irresponsible. I hope those protesting become extremely violent. My concern here is Wall Street types who are keeping prices high through their speculation games. This is going on at a time when a lot of families are really hurting. The last thing an unemployed person needs is to have gas costing 30% higher than it needs to because of Wall Street speculations. Between that and the climate of uncertainty caused by governmental dysfunction that is preventing job creation, people are getting fed up. I don't see this as being like Europe where the public wants to keep a free meal ticket in the face of financial crisis. These are Americans who are able and want to work and pay their own way but can't because of greed and brinkmanship. Obama needs to stop talking and start doing. He lied to us. I am surprised to hear conservatives giving liberals credit for having enough brains and subterfuge to covertly create an entire protest movement. But, then again, maybe not. It is human nature to judge others by what you would do in the other person's situation. Which is the wrong thing to do because you apply your own standards, while totally ignoring the other's perspective and their own standards. Translation: It takes one to know one. Dean, if capitalism actually rewards hard work and responsibility, why were bank executives who crashed the economy with lies and foolish mistakes, given large bonuses, and the people who actually worked for the banks on the front line fired? Those who made the bad decisions should have been fired not given bonuses, especially with bailout funds. For one, I am tired of hearing all of the discussions that are focused on the rich being job creators when many of them do not have anything to do with the creation of jobs. They should not be penalized for their wealth, but they should pay their fair share in taxes. It is the consumers who are the true job creators. We have already seen the massive impact that reduced consumer demand has on the economy. Help the consumer, help the economy. More equality/fairness should also be a goal of government. Violence? Really Dean? Really???!!! Why do the rethugliban/teabaggers always resort to or wish for violence? The "librul media" is LYING to you about who the protestors are. I have friends who were in NYC over the weekend. They're both middle-aged professionals, and they said while there were a few "hippies" in the mix, the majority of the crowd was just like them. The rethugliban and their lapdogs in the media are in for a rude surprise. I am sure the Tea Party is flattered by the imitation. But that's all it is. An imitation but lacking the most important feature... a common and concrete philosophy. It will diffuse when people get bored of hanging out downtown without a cause or a goal. Sandra, President Obama didn't lie to you. You just don't like what he had to say. Frankly, he's gone too far out of his way on too many occasions to reach across the aisle, only to have the rethugliban/teabaggers rip his arm off and beat him over the head with it. He should have prosecuted the war criminals in the previous administration along with the banksters who put us into this mess. While I'm not thrilled with the way he's thrown his supporters under the bus on numerous occasions, I'm informed enough to know that any of the rethugliban/teabagger clown car occupants would be infinately worse for the nation, and for that reason, I will hold my nose and vote for President Obama in 2012. NO President can do much of anything without the approval of Congress. Obama can talk all he wants, give great speeches but unless he has a Congress that will work with him, it's all talk. Sad but true and the bottom line is the POTUS gets all the blame if it doesn't work. That just goes with the job.